Thread: riding this thursday...any1 would like to join? 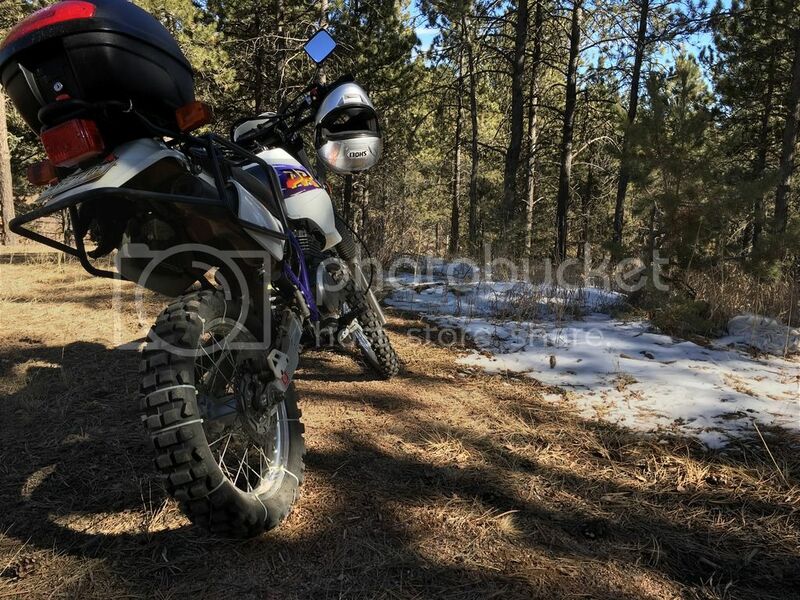 So going to take my klx250 and ride around rampart range road, 307, 303, schubarth trail, and possibly ride to rainbow falls to try out dankan road. im still a new dirt rider, so it wont be difficult trails, but they wont all be flat like 300 lol. But we can meet by garden of the gods or woodland park. let me know if anyone would like to accompany me! Re: riding this thursday...any1 would like to join? I’m a newish dirt road rider as well. I used to ride only sport and sport touring bikes, but in recent years have realized that dualsport and adventure bikes allow us to explore much more of our awesome state. There are so many fantastic dirt roads/trails here, and it’s just as must fun as riding street and track. I was thinking of riding that area this Saturday, and expect there will be others. Pic of my mule 1996 Suzuki DR350SE. hope it was a good time! What's with the ghetto rim locks Dave? While riding along a dirt road the bike suddenly felt squirmy …stopped to find the rear flat. Ouch. The good- was prepared with tools, a spare front 21 inch tube, and (some) knowledge of how to made the repair. Wireless service available very weak, but was able send text messages. The bad- I found a nail in the tire, temperatures were cool, the sun would set soon. The ugly- I’ve never changed a tube on the side of the road before, and would rather make this repair one time and in the comfort of a warm garage. Plan B was to tie wrap the tire to the rim and limp home, which worked out OK.
Nice work! I have ridden out of some crap on flats, I hate changing tubes. Rode out from the top of Webster down to Hall Valley on a front flat, that was interesting. Luckily I had recently put my rimlocks back in. HPR got 86'd. Anyone want to join at IMI 12/2/12? Riding out to byers on sat to watch races. anyone wana join?